Earlier this month, the Muon g-2 (“g minus two”) experiment at Fermilab began its second run to search for hidden particles and forces. Over the next three months, scientists expect to accumulate double the amount of data collected in Run 1 and make the world’s most precise measurement of the muon’s anomalous magnetic moment, often expressed as the quantity g-2. Run 2 features several improvements that scientists made to the experiment over the past eight months. Muons are elementary particles similar to, but much heavier than, electrons. 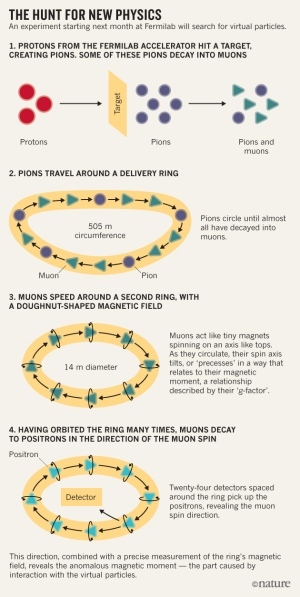 A muon’s magnetic moment — a characteristic related to the orientation and strength of its internal magnet — changes as it spins, an effect called precession. Lancaster and his colleagues are measuring the precession frequency of the magnetic moment very precisely and comparing the result to what theorists predict it should be. In doing so, they hope to confirm, or even revise, the Standard Model of particle physics. Those particles slightly change the muon’s magnetic moment. By calculating how often they will pop in and out of the vacuum and interact with the muon, scientists can predict the impact of all the known particles on the magnetic moment to very high precision. The comparison of this prediction with the experimentally obtained value will tell scientists whether there are additional, undiscovered particles or forces that change the magnetic moment. At rest, muons decay in just two millionths of a second. That decay produces two neutrinos and a positron, which is a positively charged electron. “The bulk of our data come from looking at energies and times of decay positrons that came from the muons,” said Brendan Kiburg, a Fermilab particle physicist involved in the experiment. Getting that data requires a very uniform, precisely measured magnetic field. The experiment’s storage ring magnet came to Fermilab from its original home at Brookhaven National Laboratory in 2013. After years of construction and adjustments, operators got the beam tuned up and engaged in Run 1, a three-month production run in 2018. “Because of that production run, we were able to learn about a few deficiencies that we really needed to fix,” Polly said. There are several areas the team focused on over the summer. The first was a system of quadrupole magnets that focus the muons and prevent them from spiraling up or down. 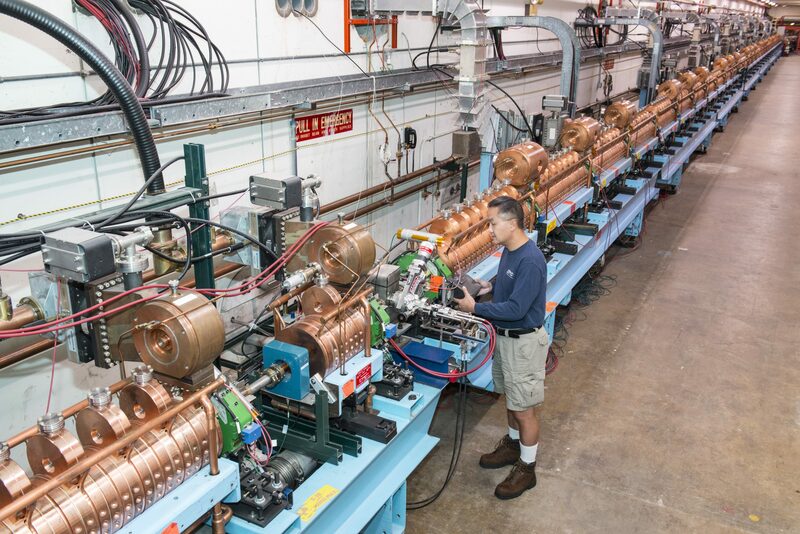 “We discovered during the shutdown that we needed to improve the reliability of the quadrupoles’ operation, especially at the higher voltages that we would like to achieve in the upcoming run,” Polly said. Another issue involved a device called an electromagnetic kicker. It shifts the muons’ orbit very slightly to keep them on a path that stays inside the ring. “The kicker is probably the single most important component of the experiment beyond the ring itself,” Kiburg said. Without the kicker, the muons behave like a Formula One driver whose racecar is at the wrong angle, sending them careening into the wall on the first lap. To avoid this, the kicker shifts the angle of the muons as they come through the ring’s gate. While the kick deployed during Run 1 at Fermilab was three times faster, it wasn’t strong enough to push the muons into precisely the perfect orbit around the ring. During the shutdown, the team upgraded the ring to accommodate a more powerful kicker. The third problem was the temperature control in the Muon g-2 building. The magnetic storage-ring is extremely sensitive to temperature — so much so that a change of more than a single degree Celsius can cause it to expand or contract, degrading the magnetic field. While performing Run 1 during the hottest summer months, maintaining the facility’s temperature was a challenge. Improvements to the facility’s heating and cooling systems should fix that, Polly said. The team recently began bringing beam to the storage ring and testing that the upgrades worked as planned. A key goal of Run 2 is to measure the magnetic moment very precisely, to 70 parts per billion. To get that kind of precision, the magnetic field must be highly uniform. The team also had to boost the experiment’s muon flux, the number of muons per second required to reach the necessary statistical precision. In Run 1, they achieved about half of their goal. A bevy of upgrades completed over the summer is expected to increase the flux to about 75 percent of the goal. A final upgrade the team is considering for next summer would get the flux the rest of the way, Polly said. One upcoming challenge is the sheer volume of data. Run 2 aims to reduce the uncertainty in the result from the Brookhaven Muon g-2 experiment by a factor of four, which requires 16 times the statistics. That’s a lot of data. And robustness and reliability require rigor. The Muon g-2 experiment is supported by DOE’s Office of Science. Summer means hot days, pool parties and Fermilab’s annual accelerator shutdown, when crews of technicians enter the tunnels to upgrade and maintain the complex machines. For many months Fermilab’s accelerator complex has been delivering quality beam to experiments, with record up times and delivery of protons. This means more data for Fermilab’s hungry physics experiments. The proton beam delivered by the accelerator complex first reached a milestone of 700 kilowatts in 2016 and has been regularly running at this impressive power since around Christmas. The last two shutdowns were focused on upgrades to improve the accelerator complex, part of the Proton Improvement Plan. The accelerator performance should see some gains when the machines come back online around mid-September. And there are still major projects in the works. Technicians will finish the second half of an upgrade to the linear accelerator, or Linac. The required components, called Marx modulators, provide high voltage for the amplifiers and were designed and built at Fermilab. As modern replacements for old vacuum tubes that are hard to repair or replace, the new pieces of tech will improve the Linac’s reliability. One particular kind of vacuum tube is known as the 1123. “There are about 90 left in the world, and Fermilab owns all of them,” Newhart said. Other work includes changing out a component known as a target, which helps produce particles for study — in this case, neutrinos. Accelerator teams will also add components to improve beamline diagnostics, modify vacuum systems, and replace and repair magnets. One particular magnet in the Main Injector accelerator will need some attention. This will be the first shutdown since Fermilab’s Muon Campus came online last year. 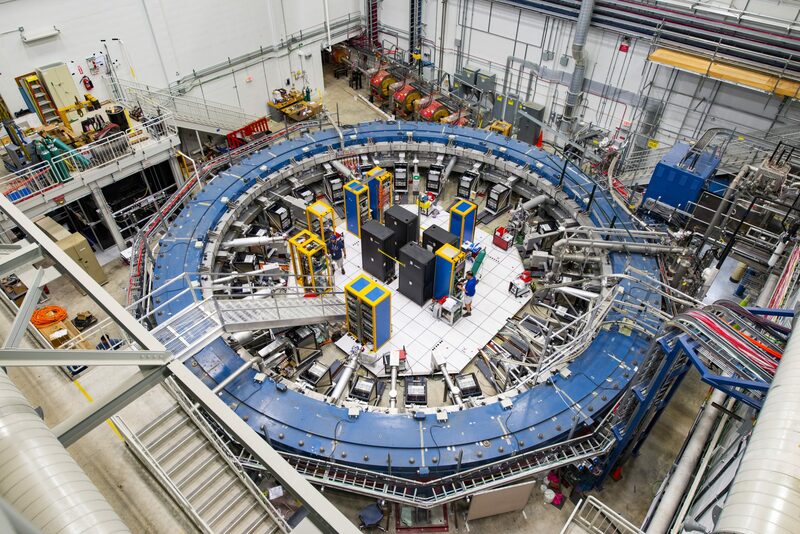 Technicians will work on the vacuum system for the upcoming muon-to-electron conversion experiment, known as Mu2e, completing about half the beamline that connects the experiment to the Muon Campus Delivery Ring by the end of the shutdown. They’ll also add devices that help reduce the spread of the particle beam for the Muon g-2 experiment. Muon g-2 reuses a giant, 50-foot-diameter particle storage ring from a similar experiment that studied properties of muons at Brookhaven National Laboratory from 1997 to 2001. The ring was transported to Fermilab in 2013 to take advantage of the lab’s powerful accelerator complex and officially started up in 2018. Scientists have already collected twice the amount of total data gathered over four years at Brookhaven. Fermilab , an enduring source of strength for the US contribution to scientific research world wide. Latest calculation based on how subatomic muons interact with all known particles comes out just in time for comparison with precision measurements at new “Muon g-2” experiment. Theoretical physicists at the U.S. Department of Energy’s (DOE’s) Brookhaven National Laboratory and their collaborators have just released the most precise prediction of how subatomic particles called muons—heavy cousins of electrons—“wobble” off their path in a powerful magnetic field. The calculations take into account how muons interact with all other known particles through three of nature’s four fundamental forces (the strong nuclear force, the weak nuclear force, and electromagnetism) while reducing the greatest source of uncertainty in the prediction. The results, published in Physical Review Letters as an Editors’ Suggestion, come just in time for the start of a new experiment measuring the wobble now underway at DOE’s Fermi National Accelerator Laboratory (Fermilab). A version of this experiment, known as “Muon g-2,” ran at Brookhaven Lab in the late 1990s and early 2000s, producing a series of results indicating a discrepancy between the measurement and the prediction. Though not quite significant enough to declare a discovery, those results hinted that new, yet-to-be discovered particles might be affecting the muons’ behavior. The new experiment at Fermilab, combined with the higher-precision calculations, will provide a more stringent test of the Standard Model, the reigning theory of particle physics. If the discrepancy between experiment and theory still stands, it could point to the existence of new particles. Finding new particles beyond those already cataloged by the Standard Model has long been a quest for particle physicists. Spotting signs of a new particle affecting the behavior of muons could guide the design of experiments to search for direct evidence of such particles, said Taku Izubuchi, another leader of Brookhaven’s theoretical physics team. “It would be a strong hint and would give us some information about what this unknown particle might be—something about what the new physics is, how this particle affects the muon, and what to look for,” Izubuchi said. 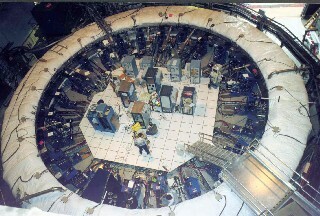 The Muon g-2 experiment measures what happens as muons circulate through a 50-foot-diameter electromagnet storage ring. The muons, which have intrinsic magnetism and spin (sort of like spinning toy tops), start off with their spins aligned with their direction of motion. But as the particles go ’round and ’round the magnet racetrack, they interact with the storage ring’s magnetic field and also with a zoo of virtual particles that pop in and out of existence within the vacuum. This all happens in accordance with the rules of the Standard Model, which describes all the known particles and their interactions, so the mathematical calculations based on that theory can precisely predict how the muons’ alignment should precess, or “wobble” away from their spin-aligned path. 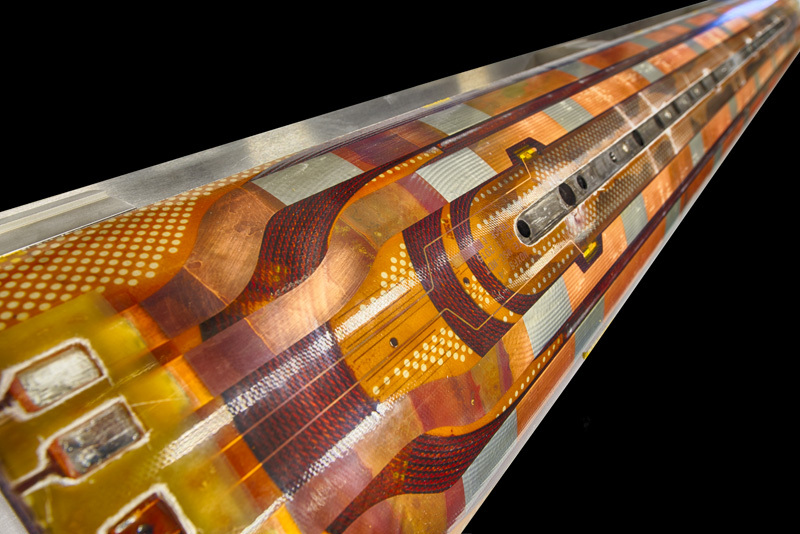 Sensors surrounding the magnet measure the precession with extreme precision so the physicists can test whether the theory-generated prediction is correct. Both the experiments measuring this quantity and the theoretical predictions have become more and more precise, tracing a journey across the country with input from many famous physicists. With lingering hints of a new discovery from the Brookhaven experiment—but also the possibility that the discrepancy would disappear with higher precision measurements—physicists pushed for the opportunity to continue the search using a higher-intensity muon beam at Fermilab. In the summer of 2013, the two labs teamed up to transport Brookhaven’s storage ring via an epic land-and-sea journey from Long Island to Illinois. After tuning up the magnet and making a slew of other adjustments, the team at Fermilab recently started taking new data. Meanwhile, the theorists have been refining their calculations to match the precision of the new experiment. “There have been many heroic physicists who have spent a huge part of their lives on this problem,” Izubuchi said. “What we are measuring is a tiny deviation from the expected behavior of these particles—like measuring a half a millimeter deviation in the flight distance between New York and Los Angeles! But everything about the fate of the laws of physics depends on that difference. So, it sounds small, but it’s really important. You have to understand everything to explain this deviation,” he said. By “everything” he means how all the known particles of the Standard Model affect muons via nature’s four fundamental forces—gravity, electromagnetism, the strong nuclear force, and the electroweak force. Fortunately, the electroweak contributions are well understood, and gravity is thought to play a currently negligible role in the muon’s wobble. So the latest effort—led by the Brookhaven team with contributions from the RBC Collaboration (made up of physicists from the RIKEN BNL Research Center, Brookhaven Lab, and Columbia University) and the UKQCD collaboration—focuses specifically on the combined effects of the strong force (described by a theory called quantum chromodynamics, or QCD) and electromagnetism. “This has been the least understood part of the theory, and therefore the greatest source of uncertainty in the overall prediction. Our paper is the most successful attempt to reduce those uncertainties, the last piece at the so-called ‘precision frontier’—the one that improves the overall theory calculation,” Lehner said. The mathematical calculations are extremely complex—from laying out all the possible particle interactions and understanding their individual contributions to calculating their combined effects. To tackle the challenge, the physicists used a method known as Lattice QCD, originally developed at Brookhaven Lab, and powerful supercomputers. The largest was the Leadership Computing Facility at Argonne National Laboratory, a DOE Office of Science user facility, while smaller supercomputers hosted by Brookhaven’s Computational Sciences Initiative (CSI)—including one machine purchased with funds from RIKEN, CSI, and Lehner’s DOE Early Career Research Award funding—were also essential to the final result. “One of the reasons for our increased precision was our new methodology, which combined the most precise data from supercomputer simulations with related experimental measurements,” Lehner noted. Other groups have also been working on this problem, he said, and the entire community of about 100 theoretical physicists will be discussing all of the results in a series of workshops over the next several months to come to agreement on the value they will use to compare with the Fermilab measurements. “We’re really looking forward to Fermilab’s results,” Izubuchi said, echoing the anticipation of all the physicists who have come before him in this quest to understand the secrets of the universe. The theoretical work at Brookhaven was funded by the DOE Office of Science, RIKEN, and Lehner’s Early Career Research Award. The Muon g-2 experiment at Fermilab is supported by DOE’s Office of Science and the National Science Foundation. The Muon g-2 collaboration has almost 200 scientists and engineers from 34 institutions in seven countries. 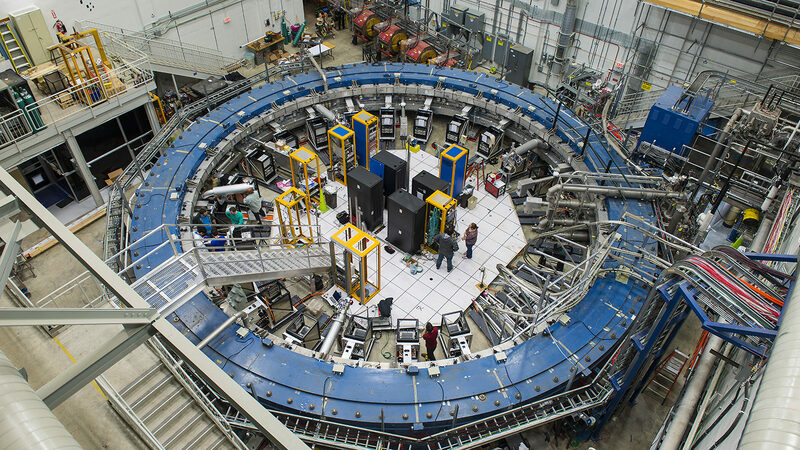 Learn more about the new Muon g-2 experiment or take a virtual tour. Muons have been accelerated by a radio-frequency accelerator for the first time, in an experiment performed at the Japan Proton Accelerator Research Complex (J-PARC) in Tokai, Japan. The work paves the way for a compact muon linac that would enable precision measurements of the muon anomalous magnetic moment and the electric dipole moment. 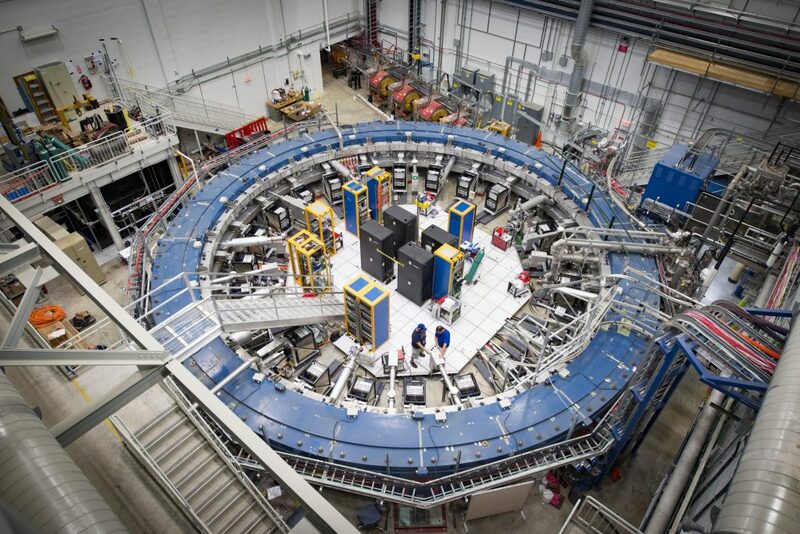 Around 15 years ago, the E821 storage-ring experiment at Brookhaven National Laboratory (BNL) reported the most precise measurement of the muon anomalous magnetic moment (g-2). Achieving an impressive precision of 0.54 parts per million (ppm), the measured value differs from the Standard Model prediction by more than three standard deviations. Following a major effort over the past few years, the BNL storage ring has been transported to and upgraded at Fermilab and recently started taking data to improve on the precision of E821. In the BNL/Fermilab setup, a beam of protons enters a fixed target to create pions, which decay into muons with aligned spins. The muons are then transferred to the 14 m-diameter storage ring, which uses electrostatic focusing to provide vertical confinement, and their magnetic moments are measured as they precess in a magnetic field. The new J-PARC experiment, E34, proposes to measure muon g-2 with an eventual precision of 0.1 ppm by storing ultra-cold muons in a mere 0.66 m-diameter magnet, aiming to reach the BNL precision in a first phase. The muons are produced by laser-ionising muonium atoms (bound states of a positive muon and an electron), which, since they are created at rest, results in a muon beam with very little spread in the transverse direction – thus eliminating the need for electrostatic focusing. The ultracold muon beam is stored in a high-precision magnet where the spin-precession of muons is measured by detecting muon decays. This low-emittance technique, which allows a smaller magnet and lower muon energies, enables researchers to circumvent some of the dominant systematic uncertainties in the previous g-2 measurement. To avoid decay losses, the J-PARC approach requires muons to be accelerated via a conventional radio-frequency accelerator. In October 2017, a team comprising physicists from Japan, Korea and Russia successfully demonstrated the first acceleration of negative muonium ions, reaching an energy of 90 keV. 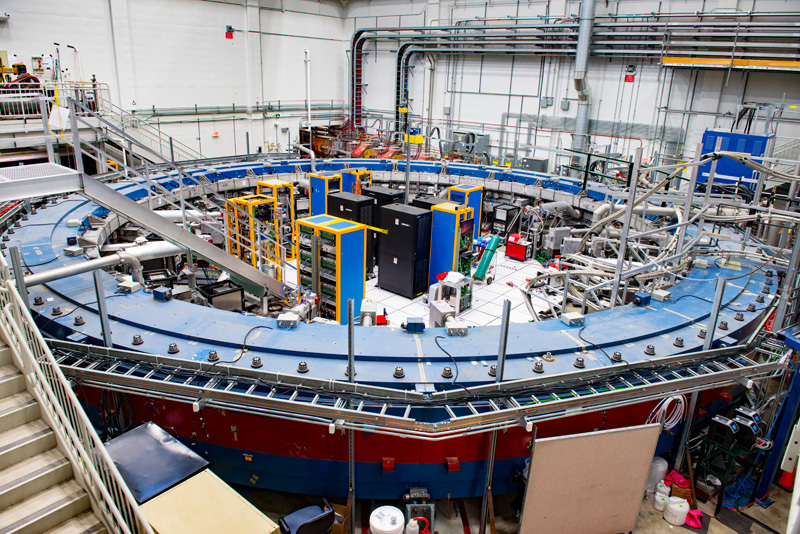 The experiment was conducted using a radio-frequency quadrupole linac (RFQ) installed at a muon beamline at J-PARC, which is driven by a high-intensity pulsed proton beam. Negative muonium atoms were first accelerated electrostatically and then injected into the RFQ, after which they were guided to a detector through a transport beamline. The accelerated negative muonium atoms were identified from their time of flight: because a particle’s velocity at a given energy is uniquely determined from its mass, its type is identified by measuring the velocity (see figure). Muon acceleration is also key to a potential muon collider and neutrino factory, for which it is proposed that the large, transverse emittance of the muon beam can be reduced using ionisation cooling (see Muons cooled for action). MUSE and NEWS are two new endeavors at the DOE Office of Science’s Fermilab, the U.S.’s premier particle physics laboratory. And contrary to what some physics fans might infer, the acronyms don’t stand for science experiments. 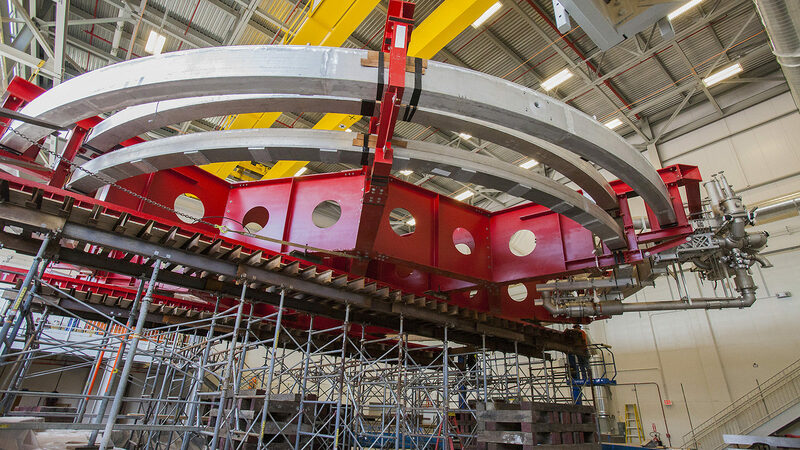 They’re two new bridge-building grant programs that are designed to enable scientists from Europe to conduct particle physics research at Fermilab. MUSE and NEWS are two grant programs by which nearly 150 European scientists come to Fermilab to help advance its research, in particular on the laboratory’s muon experiments and superconducting accelerator technology. Their contributions total the equivalent of $15 million in salaried work. The RISE scheme promotes international and cross-sector collaboration through the exchange research and innovation staff and by sharing knowledge and ideas from research to market (and vice versa). 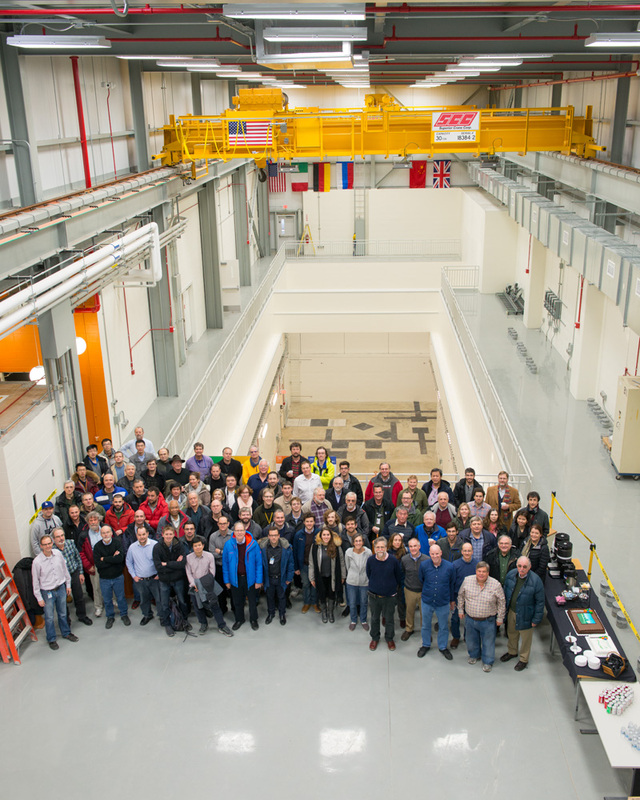 MUSE, which started in 2016, is coordinated by INFN researcher Simona Giovannella and supports roughly 70 scientists from universities and research institutes in Germany, Greece, Italy and the UK to work on Fermilab’s Mu2e and Muon g-2 experiments. The European scientists will contribute to an impressive 400 months’ worth of contributed work over four years to help further the cutting-edge particle detector technologies needed to look for hidden or rare particles predicted by theory but, as of now, never observed by experiment. Fermilab scientist Doug Glenzinski coordinates this activity at the lab. NEWS was proposed a year later, in 2016, to advance a number of fields in particle physics. Through NEWS, scientists from Germany, Greece, Italy and Sweden come to Fermilab to study muon physics and superconducting accelerator science. They also go to Caltech, NASA, SLAC National Accelerator Laboratory, and U.S. companies, as well as to the Japanese National Astronomical Observatory in Japan. Fermilab in particular will enjoy 100 months’ worth of contributed work over four years through NEWS, beginning in 2018. The roughly 60 visiting scientists will work on superconducting technologies for particle accelerators and detectors. Barzi coordinates this activity at Fermilab. Outreach is a crucial component of participation in a RISE-funded program. MUSE and NEWS scientists at Fermilab are required to conduct science outreach in some way during their time at the lab. Many, for example, participate in the laboratory’s international summer students program, which was initially established by University of Pisa Professor Emeritus Giorgio Bellettini for visiting Italian university students in 1984. It’s all a part of the benefits-of-networks ethos in science, and for RISE in particular. The connections made in particle physics do more than advance research careers. They attract the next generation of scientists and benefit humanity. MUSE and NEWS are just two manifestations of the principle, and Barzi expects to see a resulting expansion and strengthening of the research community. Further details about RISE work plan 2018-2020 and the upcoming call for proposals is available online. What do you get when you revive a beautiful 20-year-old physics machine, carefully transport it 3200 miles over land and sea to its new home, and then use it to probe strange happenings in a magnetic field? Hopefully you get new insights into the elementary particles that make up everything. The Muon g-2 experiment, located at the US Department of Energy’s Fermi National Accelerator Laboratory, has begun its quest for those insights. Take a 360-degree tour of the Muon g-2 experimental hall. On May 31, the 50-foot-wide superconducting electromagnet at the center of the experiment saw its first beam of muon particles from Fermilab’s accelerators, kicking off a three-year effort to measure just what happens to those particles when placed in a stunningly precise magnetic field. The answer could rewrite scientists’ picture of the universe and how it works. Getting to this point was a long road for Muon g-2, both figuratively and literally. The first generation of this experiment took place at Brookhaven National Laboratory in New York State in the late 1990s and early 2000s. The goal of the experiment was to precisely measure one property of the muon—the particles’ precession, or wobble, in a magnetic field. The final results were surprising, hinting at the presence of previously unknown phantom particles or forces affecting the muon’s properties. Three summers ago, a team of scientists and engineers on the Muon g-2 experiment moved a 52-foot-wide circular magnet 3200 miles over land and sea. It traveled in one piece without twisting more than a couple of millimeters, lest the fragile coils inside irreparably break. It was an astonishing feat that took years to plan and immense skill to execute. As it turns out, that was the easy part. The hard part—creating a magnetic field so precise that even subatomic particles see it as perfectly smooth—has been under way for seven months. It’s a labor-intensive process that has inspired scientists to create clever, often low-tech solutions to unique problems, working from a road map written 30 years ago as they drive forward into the unknown. The goal of Muon g-2 is to follow up on a similar experiment conducted at the US Department of Energy’s Brookhaven National Laboratory in New York in the 1990s. 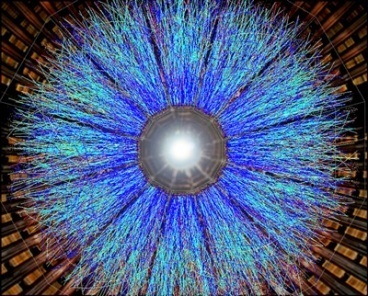 Scientists there built an extraordinary machine that generated a near-perfect magnetic field into which they fired a beam of particles called muons. 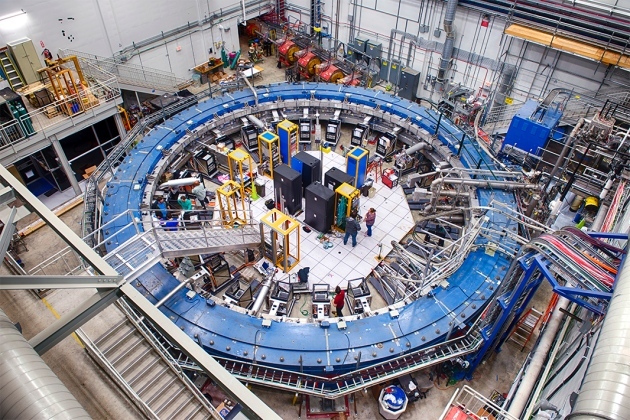 The magnetic ring serves as a racetrack for the muons, and they zoom around it for as long as they exist—usually about 64 millionths of a second. That’s a blink of an eye, but it’s enough time to measure a particular property: the precession frequency of the muons as they hustle around the magnetic field. And when Brookhaven scientists took those measurements, they found something different than the Standard Model, our picture of the universe, predicted they would. They didn’t quite capture enough data to claim a definitive discovery, but the hints were tantalizing. Now, 30 years later, some of those same scientists—and dozens of others, from 34 institutions around the world—are conducting a similar experiment with the same magnet, but fed by a more powerful beam of muons at the US Department of Energy’s Fermi National Accelerator Laboratory in Illinois. Moving that magnet from New York caused quite a stir among the science-interested public, but that’s nothing compared with what a discovery from the Muon g-2 experiment would cause. To start making these measurements, the magnetic field needs to be the same all the way around the ring so that, wherever the muons are in the circle, they will see the same pathway. That’s where Brendan Kiburg of Fermilab and a group of a dozen scientists, post-docs and students come in. For the past six months, they have been “shimming” the magnetic ring, shaping it to an almost inconceivably exact level. Since the idea is to measure the precession rate to an extremely precise degree, the team needs to shape the magnetic field to a similar degree of uniformity. They want it to vary by no more than ten parts in a billion per centimeter. To put that in perspective, that’s like wanting a variation of no more than one second in nearly 32 years, or one sheet in a roll of toilet paper stretching from New York to London. How do they do this? First, they need to measure the field they have. With a powerful electromagnet that will affect any metal object inside it, that’s pretty tricky. The solution is a marriage of high-tech and low-tech: a cart made of sturdy plastic and quartz, moved by a pulley attached to a motor and continuously tracked by a laser. On this cart are probes filled with petroleum jelly, with sensors measuring the rate at which the jelly’s protons spin in the magnetic field. The laser can record the position of the cart to 25 microns, half the width of a human hair. Other sensors measure how far apart the top and bottom of the cart are to the magnet, to the micron. Erik Swanson of the University of Washington is the run coordinator for this effort, meaning he directs the team as they measure the field and perform the manually intensive shimming. He also designed the new magnetic resonance probes that measure the field, upgrading them from the technology used at Brookhaven. Swanson says that the accuracy to which the team has had to position the magnet’s iron pieces to achieve the desired magnetic field surprised even him. When scientists first turned the magnet on in October, the field, measured at different places around the ring, varied by as much as 1400 parts per million. That may seem smooth, but to a tiny muon it looks like a mountain range of obstacles. In order to even it out, the Muon g-2 team makes hundreds of minuscule adjustments by hand. Stationed around the ring are about 1000 knobs that control the ways the field could become non-uniform. But when that isn’t enough, the field can be shaped by taking parts of the magnet apart and inserting extremely small pieces of steel called shims, changing the field by thousandths of an inch. There are 12 sections of the magnet, and it takes an entire day to adjust just one of those sections. This process relies on simulations, calibrations and iterations, and with each cycle the team inches forward toward their goal, guided by mathematical predictions. Once they’re done with the process of carefully inserting these shims, some as thin as 12.5 microns, they reassemble the magnet and measure the field again, starting the process over, refining and learning as they go. His colleague Rachel Osofsky, also of the University of Washington, agrees. Osofsky has helped put in more than 800 shims around the magnet, and says she enjoys the hands-on and collaborative nature of the work. Kiburg says the Muon g-2 team should be comfortable with the shape of the magnetic field sometime this summer. With the experiment’s beamline under construction and the detectors to be installed, the collaboration should be ready to start measuring particles by next summer. Swanson says that while the effort has been intense, it has also been inspiring.